Is it just me or were fortune cookies once upon a time more interesting, more likely to cause a reaction or elicit an, “oooh?” These days the ones I open seem to be more little affirmations, or positive-thinking slogans, not that I have anything against the power of positive thinking unless of course, it means unrealistic thinking, and I suppose that touches on a different and debatable topic. I only wish to point out that fortune cookies used to be more intriguing, mysterious, and fun. Maybe I’ve just finally grown up, but I don’t look forward to opening them anymore. On the left is a grouping from our last order (we must have gotten a lot of food). 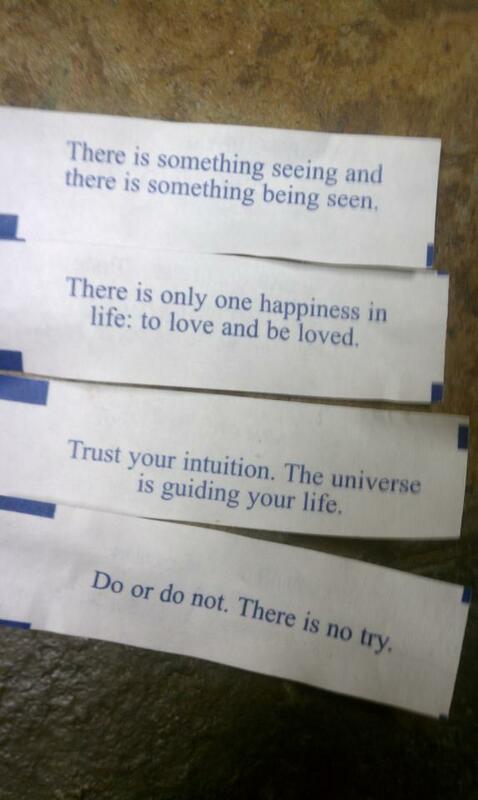 The first one seems to have a bit of the old mystery about it; the last one is a Yoda quote, but the ones in between? Eh. Nice thoughts, but there is no gut punch to them. Does that make any sense? Do I really want my fortune cookies to be tiny Chinese poems? Maybe I do. Maybe I do. I suppose you can still add the words “in bed” at the end of them, particularly the Yoda quote. Keep true to the dreams of youth. you'll be disillusioned soon enough. Your ideals are within your reach. of being an idealistic dreamer. Too bad they're so impractical. but hesitate and you'll fail. You are well liked and much-loved. but don't turn around just now. and you thought it was bad before. Good luck will bestow upon you. Oh, this was great! Love how you twisted them into something darker and much more real. Just love what you added to the fortune cookies….made them far more interesting…bravo! I don’t know, the universe is guiding you? That seems a little mysterious to me. I get what you’re saying, though, and I’m on board. Nice poem, too. I haven’t dined at a place where fortune cookies were given since I was single. Then it was with a bunch of girl friends. And we squealed and giggled with little knowing smiles at the fortunes we got and said, “Naughty, Naughty”. Those were the fortunes of the good old days. I so enjoyed this poem. Maybe it’s the cynic in me but I love the angel and devil motif. Thank you, Jane. I hadn’t thought of it that way, but you’re right. It is sort of a twist on the good angel/ bad angel on each shoulder. Thanks for the insight! I love it! Great poem! Fortunes never sounded so good! Thank you, PC! I appreciate those words very much.